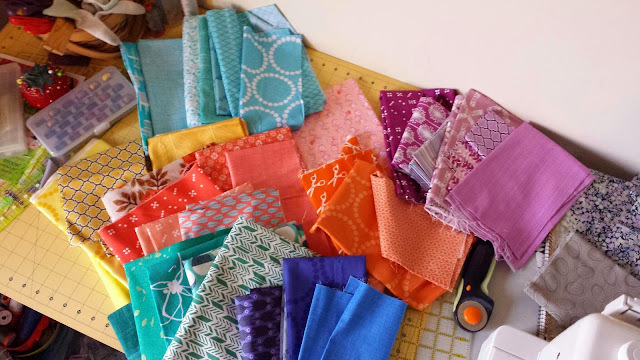 Quilty Habit: Supernova Swap is a go! This week, I put my crazy self out there on Instagram (I'm @quiltyhabit) and asked anyone if they wanted to be partners for the Supernova Friendship Block Swap, hosted by Stephanie and Sandra. I always admired Lee's Supernova quilt (like, whoa) but I missed the QAL when it happened. This seemed like the perfect chance to make a quilt/make a friend! Thanks Sandra and Stephanie! I asked for someone who I didn't know well. Again, putting myself out there - all the quilty friends do amazing (AMAZING) work, but it's fun to get to know someone new, right? Karin responded to my post first and we've become fast friends! I know this because we both love Sunnyside by Kate Spain. We are also indecisive so we've been emailing back and forth. Haha. :) I guess it's the nature of making something with another person. We're toying with the idea of (okay, we've pretty much committed to) using Robert Kaufman Quilter's Linen in Midnight as the background. I suggested it because I fell. in. love. with this quilt by Pixels to Patchwork. It's a little risky but with the right bright fabrics, they will be beautiful quilts. Plus, I love low volume and gray backgrounds, but I have way too many of those quilts around right now! An initial fabric pull. Especially loving coral, yellow, orchid, teal, and tangerine. Planning a quilt (actually two identical ones) with someone is way too much fun! So, are you joining the swap? You can get all the details right here! The first block isn't due to your partner until June 15, so there's plenty of time. If you don't have a partner in mind and you don't want to throw yourself out there like I did, you can ask Stephanie and Sandra to pair you up! Isn't that great? Sounds like fun, and those fabrics with the blue is going to be gorgeous! I can.not join any more swaps right now, so over committed and I keep choosing to do the most time consuming, complicated route. But it'll be fun to see what you do with this! No head shaking going on here! You had me at coral, yellow, orchid, teal, and tangerine. Well, maybe before that. . . I'm doing it!! Even though I too, don't need another project added to my list but this seemed so fun I couldn't pass it up... I think I'm going to need to start up a diary to just keep track of everything I've signed up to! Oh, I love your idea for the quilt. :D And even better, I'll get to see Karin's up close! I adore those colours you have chosen! Been following for a while and loving the colours you are using!